It was the last lesson of the day, and the young man at the piano had more or less used up all his brain-power for the day. He was getting more and more confused, less and less interested, and things were not progressing in any useful direction. Looking round for inspiration, I found some weird piece of plastic lying on a shelf. 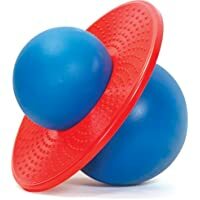 I think it was the red bit from one of these hoppers that gets left behind once the blue bubble part gets broken. Anyway, there it was, and I plonked it on the floor, stepped onto it, hopped to change feet, and stepped off, saying something along the lines of ‘finger swaps go like this…’. He was only too pleased to have an excuse for abandoning the piano to hop on and off a plastic thingy. After a couple of goes, I suggested he go back and try the exercise. Result; complete comprehension of the ‘skill’ (that’s the word they use in football training) and he was able to do it with any pair of fingers, with either hand, with no problems and great enthusiasm. Hours of explanation (I’m prone to exaggeration) and faulty learning and negative experience, all averted by the use of a broken plastic toy and a bit of large scale movement. I’m sure something along these lines can be used in other instrument teaching as well. This entry was posted in Lessons that have happened, Piano and tagged movement activity. Bookmark the permalink.